Many researchers rely on data from the Pennsylvania Health Care Cost Containment Council (PHC4) to conduct studies on important health care topics. One such researcher, Jeremy M. Kahn, MD MS, focuses his studies on how to manage and organize critical care to improve patient outcomes and reduce costs in intensive care units (ICUs), which deliver care to the hospital’s sickest patients with a high risk of death. While these critically ill patients represent a minority of hospital patients, their care makes up a large proportion of costs. “PHC4 data are simply exceptional; I can’t imagine doing my research without it,” said Dr. Kahn, Associate Professor of Critical Care, Medicine and Health Policy in the University of Pittsburgh School of Medicine and Graduate School of Public Health since 2010. Previously, Dr. Kahn conducted his research on critical care services at the University of Pennsylvania School of Medicine. For his research, Dr. Kahn requested customized PHC4 inpatient discharge datasets, linked with death data from the Pennsylvania Department of Health. “PHC4 data is an incredible resource for health care researchers because of the excellent quality of the data,” Dr. Kahn stated. When using data from other states, his studies are often restricted because of missing values and limited numbers of variables. Another plus to PHC4 data is the capability of risk-adjustment, which allows him to make apples-to-apples comparisons of outcomes in intensive care units across hospitals. Risk adjustment “levels the playing field” by taking into consideration the severity of patients’ illness. His research seeks to determine which measurable hospital factors are associated with high quality outcomes, with the goal of exporting those practices to other hospitals that have room for improvement. In a study published in The Archives of Internal Medicine (2/22/10), Dr. Kahn and his colleagues concluded that daily ICU rounds by an interdisciplinary team consisting of physicians, nurses, respiratory therapists, clinical pharmacists and other staff members are associated with lower mortality among medical ICU patients. This interdisciplinary care/cooperative care model could be a powerful way to improve ICU outcomes nationwide. Dr. Kahn has also used PHC4 data to study how patients’ insurance status affects mortality and treatment of critical illness and look at patterns of post-acute care use in patients discharged from the ICU. Other studies by Dr. Kahn’s research team found that ICUs with higher volume tend to have better outcomes -- “practice makes perfect,” Kahn said. So his continuing research will determine what the higher-volume hospitals are doing well, so that these practices can be exported to smaller hospitals with lower volumes. In so doing, they can work together to elevate the quality of care at all hospitals. Dr. Kahn is Associate Professor of Critical Care, Medicine and Health Policy in the University of Pittsburgh School of Medicine and Graduate School of Public Health. He is a core faculty member in the Clinical Research, Investigation and Systems Modeling of Acute Illness (CRISMA) Center in the Department of Critical Care Medicine, where he directs the CRISMA Program on Critical Care Health Policy. 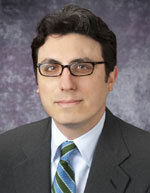 Dr. Kahn’s research program focuses on the organization, management, and financing of critical care services. Specific areas of interest include ICU workforce and staffing, quality measurement, benchmarking, and regionalization of critical care. His group’s work integrates approaches from the fields of epidemiology, health services research, health economics and operations management to investigate novel strategies for increasing the quality and efficiency of critical care. He holds several grants from the National Institutes of Health examining the effect of ICU organization on the outcome of care for patient’s critical illness. He spends his clinical time attending in the Solid Organ Transplant ICU at the University of Pittsburgh Medical Center’s Montefiore Hospital.